Our community of passionate, curious minds is one that turns values into vision and ideas into action. Find yourself here. Welcome! There are many ways to plan your estate so that your legacy continues in a manner that pays tribute to you and your loved ones, while supporting future generations of students at Mary Washington. Our website provides articles, resources, and interactive tools to help you assess your options and craft the legacy that best reflects your needs and desires. Please contact UMW's Office of Gift Planning if you have any questions or concerns. 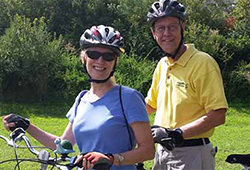 Lisa Rae Campbell Walker '77 and her husband, Andrew, believe in having fun. They bike, hike, kayak, and enjoy travel as much as possible. "I believe that life is meant to be lived joyously," says Lisa Rae. "And, it's more important what good you do on earth, than worrying about what happens afterward." That philosophy has guided her life. Born in an Army hospital in Puerto Rico, Lisa Rae grew up in Chesterfield County, Virginia. The fifth child in her family, she was the only one to enter college directly after high school. "I was just 16 when I graduated from high school, but I knew where I wanted to go to college," says Lisa Rae. "Mary Washington was the only school I applied to, and I immediately fell in love with it." She says her entire Mary Washington experience was great, from the small classes, to the extracurricular activities, to the wonderful support from all the professors. "They all knew our names, and some of our professors would invite us to their homes. I remember one great trip to Niagara Falls with Professor Marshall Bowen for a geomorphology class to study the geology of the Great Lakes region. I learned a lot and made great memories." 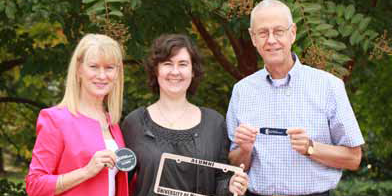 With her Mary Washington diploma and a major in geography, Lisa Rae took a few graduate courses and then began working for the Hertz Corporation. Her journey detoured slightly as she developed an interest in human resources and then earned a master's degree in human resource development from George Washington University. At the age of 40, Lisa Rae changed course again. This time she earned a master's of teaching at Virginia Commonwealth University and began teaching history, civics, and economics in a Richmond middle school. "I'm truly thankful for the liberal arts background I received at Mary Washington," says Lisa Rae. "That strong foundation gave me the flexibility to make these career changes and choices. I enjoyed each and every experience." Lisa Rae retired in 2008 to spend time with her husband, Andy, a graduate of University of Virginia and a retiree from Capital One. They keep busy with their many activities, enjoy helping others, and take time to travel. Recently, the couple became members of the Heritage Society when they shared their plans to bequeath a significant gift to the Fund for Mary Washington. "It was an easy process," says Lisa Rae. "We both updated our wills and made provisions now so that our wishes are clearly known. Supporting the Fund for Mary Washington was an easy decision because we always hear President Hurley talk about how unrestricted funds provide flexibility to do things that are most needed." Lisa Rae and Andy visit Mary Washington often for reunions, Heritage Society events, and family legacy events. "We love meeting and talking to students," says Lisa Rae. "It's also really exciting to keep up with changes on campus, including evolving technology in the study of geography." Lisa Rae offers one bit of advice for Mary Washington alumni and friends who are considering estate planning options. "Do it now," she says. "Then go have fun."